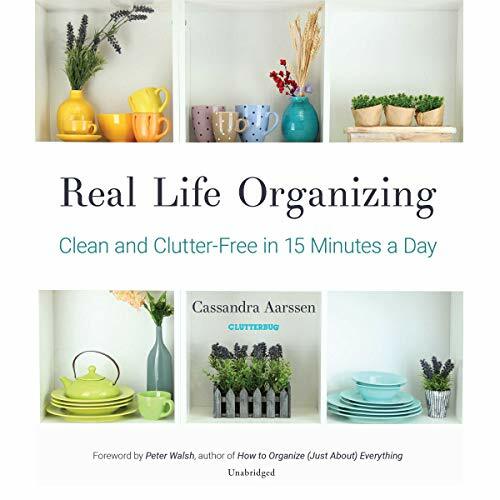 Organizational expert Cassandra "Cas" Aarssen, the guru from YouTube's ClutterBug channel, reveals her tips, tricks, and secrets to a clean and clutter-free home in just 15 minutes a day. Aarssen spends her time organizing other people's homes, teaching college workshops on organization, and creating weekly videos and blog posts. Cas offers DIY Pinterest-type tips to people like you who are interested in how to get rid of clutter and how to organize your home. Organized person on the outside: The secret to her success? She's a giant mess on the inside, but an organized person who can teach you how to get rid of clutter and organize your home once and for all. Simplify your life: In her debut, Real Life Organizing, Cas walks you through the steps you can take to create a beautiful, organized, clutter-free, and almost self-cleaning home - a DIY Pinterest home. Simplify your life. You do not have to get rid of all of your things, you do not have to be a yoga-loving minimalist, and you do not have to radically change your lifestyle or personality in order to simplify your life and have an organized home. The truth is that you do not need to actually be an organized person to live like an organized person. Organize home: Through her years of experience as an industry expert, Cas has uncovered easy and inexpensive tips, tricks, and solutions that allow her to maintain a clean, organized, and functional home with minimal effort. After you've listened to Real Life Organizing, you too will be able to live a more organized life without having to give up your sanity. ©2018 Cassandra Aarssen (P)2018 Blackstone Audio, Inc. This book is so helpful but the voice actress is a terrible fit. She sounds deliberate and condescending, not animated and positive like the author almost certainly intended. This is a very good book if you're looking to create your own system for a Clutter-Free home/life. You'll find very practical, down to earth advice and suggestions, but what I found truly special was that it contains a way to determine which clutter/organizing style you have. That's incredibly helpful for families where different people have different styles and concecions have to be made so that the family could live a Clutter-Free life together. It helps you better understand yourself and your family. I couldn't recommend it more, it's just a really helpful, fantastic organizing book! I have read lots of cleaning, organizing, purging, minimalist books and was in search of a book that didn’t just explain what “being organized” meant or how I needed to change my lifestyle. I wanted someone to tell me where to start and how to do it. I love this Book and will read it/listen to it again and again. I will recommend it to all my mom friends, not just the ones that need help organizing but all moms. I love Clutterbug! Cass had made organizing so much more relatable! I do NOT care for the voice doing the narrative.. No offense but I love watching the Clutterbug Youtube videos and I hate that she wasn’t allowed to read her own books for the audio version! Nobody could do it justice like she can. An absolute must read! If you struggle with organizing you simply must read this book! Love Love Love!